What is a holiday without a few luxury treats to make the experience special? 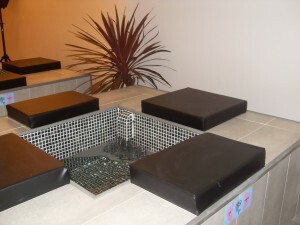 The Natural Fish Spa in Javea offers one of these little luxury breaks from sunbathing on the beach with a rather divine cocktail of fish therapy, massage and a variety of beauty products as add ons. The shop itself is an impressively classy setup with scented candles burning, calm background music and stylish furnishing in a modern fashion. Fish Treatment – What Is It Like? Basically, you buy a 30minute session of fish therapy. The session starts with a thorough cleaning of your feet for hygienic reasons before you´re seated at a small pool with fish inside. Stick your feet in the water and for the next 30minutes the Garra Rufa fish will nibble away at your dead skin cells to leave your feet smooth and soft. The treatment itself may sound scary with a gang of fish eating away at your feet, however these tiny fishies do not actually have teeth or cause any level of pain or discomfort. To the contrary, the sensation is somewhat tingling and not unlike a gentle massage. The calm ambiance of the shop and deliberate stimulation of the senses with tranquil music and gratifying smells makes for a highly pleasurable 30minutes of serenity and soothing delight. During the session you´re treated to a free drink of your choice and if you can get your eyes of the fascinating fish at work on your feet there´s a variety of literature available as well. The Garra Rufa fish originate from Turkey where they have been used for pleasure and treatment of skin problems for centuries. Their mouths contain a mild antiseptic, thus making their efforts not only smoothing of the skin and sterile but healing as well. British tourists and expatriates may have a certain reluctance towards fish therapy after a polemic story in The Sun a few years ago casting doubts on the safety. However, the NHS in the UK did in fact investigate and concluded that whilst nothing is 100% risk free in this world, having fish therapy is significantly safer than having a swim in your pool or entering a communal pool. The reason basically is that the filtering of the small fish therapy tanks is much more efficient than in a pool and the antiseptic feature of the fish makes their efforts sterile. You can find the the full report and investigation on the NHS website. 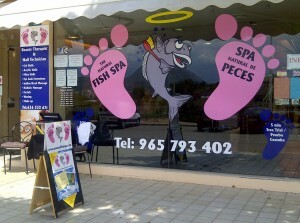 Once your feet have been thoroughly nibbled by Garra Rufa fish you will find your feet very soft and smooth. Its almost like a silk layer has been applied all around your feet. To top of the experience you can buy little extras in the shop, personally I went for a foot massage which adds a wondrous icing on the already delicious cake. Miss Magic Fingers is ready to provide your feet with an extremely pleasant after-therapy massage, but indeed the Natural Fish Spa has a full range of extras available such as full body massage, Indian head massage, nail painting and eye lash extensions. The cost of the fish therapy is a modest 20euros with discounts available for multiple treatments and the add on foot massage ordered in this case was 5euros extra. For a full on luxury experience with healing effects, a free drink, a massive effort put into perfect hygiene and the tranquil atmosphere of the surroundings, seems astonishingly cheap. The Natural Fish Spa does not require you to book in advance, but during the busy summer season it might be advisable to do so to avoid waiting around for a free spa. You can call and make a booking on 965 793 402, email at naturalfishspa@yahoo.com or visit Natural Fish Spa on facebook for a quick and easy booking of your feet therapy. A fish therapy is definitely a fantastic option after a long day on the beach, for sore fiesta feet that has walked the hills of old town for days or if you simply want to spice up your vacation in Javea with a little luxury extra. Please note that we are in no way affiliated with the Natural Fish Spa. We book, go and try it out, pay the normal price and report back with a recommendation if the experience is good enough. In this case it most certainly was and the hungry Garra Rufa fish have found another regular customer to feed on! This entry was posted in Costa Blanca News, Holiday In Spain, Javea-Xabia and tagged feet treatment javea, fish therapy, fish treatment, garra rufa fish, luxurious holiday javea, luxury holiday treats, natural fish spa javea, natural-fish-spa-javea-therapy, pece, spa natural de peces. Bookmark the permalink. Just been back for a second treatment – and brought a mate this time. Both had a very pleasant time yet again… I think this is becoming a regular thing. There’s so many review sites where you know the reviewer is getting a freebie, and therefore produces a biased report. It quite refreshing to read the truth without any financial incentives to sway the results. Also, most reviewers seem to concentrate on restaurants. Again, its good to see ‘other’ businesses being reviewed.